Established in 1999, FilesAnywhere has been around for a lot longer than many companies we have reviewed here. It’s so surprising that they don’t get as much media attention as other companies now, especially when they offer plethora of amazing features which will surprise you. In fact, many features FilesAnywhere offer to its users aren’t anywhere to be seen at its major competitors. Read details below or sign up now. FilesAnywhere combined both online file storage and cloud backup into one neat package, and also offer syncing on top of file storage. At a first glance, the brand name and the website will remind you of other file sharing services such as 4shared, MediaFire and SendFile. But when you look closer, or sign up, FilesAnywhere will definitely surprise you. Many of its features offered may seem to be only useful for companies or teams, but in many circumstances they are also useful for individual users. Only thing we have an issue with FilesAnywhere is with its price per GB. But if you are an individual user and can content with 1GB storage space, FilesAnywhere has a free plan with all other features included. Larger storage and additional users will cost you more. By looking at the storage cost and its features, it’s clear that FilesAnywhere is intended towards collaborative file storage and syncing on the cloud, rather than real-time backup of your whole machine. Having said that, its interesting features that help us in storing, organizing and sharing our documents and important personal data on the cloud definitely make FilesAnywhere a viable choice for any personal users and businesses. Take a look at them after the break. FilesAnywhere currently offers four plans: two for home users, one for SMBs, and one plan for enterprises. Features seem to be more or less the same, with FTP, SFTP & WebDAV access, more reporting, user management and white label branding options for SMBs and enterprises. There is 30-day free trial offer and personal users can enjoy a free plan which has limited storage but not in features. FilesAnywhere lets you use all of their features without any hidden charges, except those that are only available for plans intended for SMBs and enterprises. Let’s take a look at the plans. 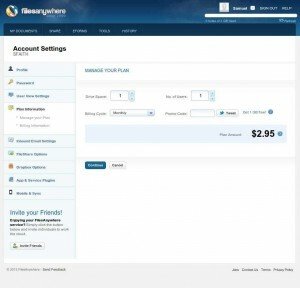 FilesAnywhere offers two plans here: Free and Advanced. Free. 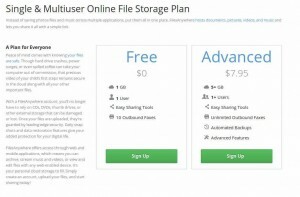 You will enjoy 1GB of free storage for 1 user, and 10 outbound faxes. All other features of Home plans are accessible, except automatic backup, version control, FTP, SFTP, & WebDAV access. N.B: One thing to note with Free plan is that you can always upgrade your storage or add additional users in your online dashboard. And when you do that, you don’t need to jump straight to Advanced plan, nor any other higher tier plans. And it seems like you can still maintain same disk space (1GB) but upgrade your account to be a paid account (which lets you enjoy FTP/SFTP/WebDAV access and other features that Advanced plan has) and it will cost $2.95 per month. Each additional 1GB will cost $1 more, and each additional user will cost $3 more on your monthly bill. Oh and if you tweet about FilesAnywhere from billing page, you will get additional 1GB for free too. 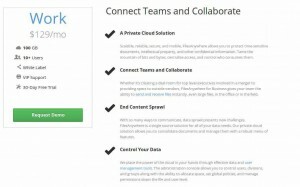 FilesAnywhere offer one plan for SMBs under this. Work. $129 a month, and it will get you 100GB storage for 10+ users, white label branding options, and VIP support. Oh and you get 30-day free trial too. Advanced features such as FTP/SFTP/WebDAV access, collaborative sharing functions are also available, so as detailed reporting and advanced user management. 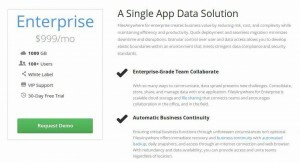 Clearly, this is intended for enterprise customers and FilesAnywhere will provide tailored solution for your business. Enterprise. $999 per month, and this will give you 1000GB of storage for 100+ users. But you can request for more storage and users, as well as customizing other features to fit your business needs. Now this is the part that got us feel like running a marathon. FilesAnywhere happen to have exhausting list of features, and we advice you to go grab some drinks before you continue to read. Trust us, it’s gonna be a long one. Syncing. Think Dropbox. FilesAnywhere client software will let you do something similar to that. Nothing much to talk about here. Real-time backup. 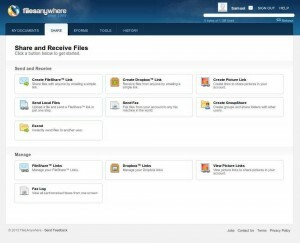 Using FilesAnywhere client software, you can set it to backup certain folders in real time. After initial backup is complete, FilesAnywhere software will monitor the folder for any changes and do incremental backups. Daily Snapshots. This is just a fancy name of deleted file retention and versioning. FilesAnywhere will keep your files previous versions for up to 30 days so that you can easily restore even after deletion, or just go back to a version from a previous date. FileShare Links. You can generate single or multiple files, or even whole folders, by generating share links. You just need to give the link to whoever you want. GroupShare. Using GroupShare, you can share your files and folders to only selected group of contacts. They need to be FilesAnywhere users though. Dropbox Links. Not to be mistaken with Dropbox, the most popular cloud-based file storage and syncing service, Dropbox Links from FilesAnywhere is actually a way to receive files from other people. Using Dropbox Links, they can get to a web page where they can just upload files they want to send to you and those files will be automatically uploaded into your FilesAnywhere account. Picture Link. While you can definitely use FileShare Links, Picture Links can show your photos as slides or in album format, rather than a list of files. Send Local Files. If you would like to share files to other people but that file isn’t in your FilesAnywhere account, you can use Send Local Files function which will do both: uploading and sharing, at the same time. Send Fax. Yup, you read that right. You can send fax of images and documents and any other file types that FilesAnywhere can read to any numbers in the world. 10 outbound faxes are included with free account, while paid accounts get virtually unlimited outbound fax. But seriously, who still send fax these days? Convert Docs and Images to PDF. 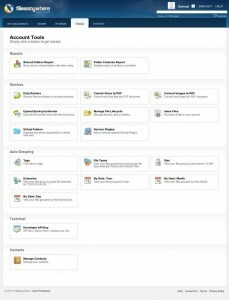 For those of you that need to convert your documents and images to PDF, you can do so right in the web dashboard of your FilesAnywhere account. It makes things so much simpler to share some files since everybody can open PDF files, even in browsers. Virtual Folders. You can definitely create real folders and put your files in them, but when you want to give structure to your files without changing the folder structures, you can use this feature. Basically, those folders can be seen only in FilesAnywhere, and nothing else. Life Cycle for Files & Folders. Basically, you can setup lifecycle rules for automatic deletion of files and folders. You can set how many days a file or folder will be live, and after that duration, they will be automatically deleted. Pretty cool if you want to share a file for only specific period. Zoho Editor. Using Zoho Editor integrated into FilesAnywhere web client, you can edit your spreadsheets, slides and documents. Aviary Photo Editor. Aviary is a powerful web app that lets you edit your images and it will work with most popular image file types. It is integrated with FilesAnywhere web client. Blogger.com & WordPress.com Posting. 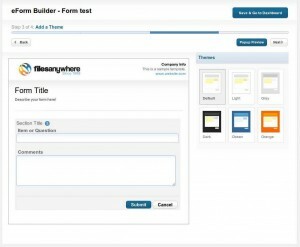 You can post to your blogs on Blogger.com and WordPress.com together with files shared from your FilesAnywhere account. This is especially if you have a big file you want to share on your blog but doesn’t want to upload there. And some file formats may not be allowed to upload on the two blogging platforms. AutoDesk Freewheel. AutoCad engineering drawings (dwf files) can be viewed directly from FilesAnywhere web client, using its integrated AutoDesk Freewheel app. Backup Your Tweets. Simply log-in using your Twitter account and “Allow” FilesAnywhere to have access to your Twitter account, then it will automatically backup your tweets. Very neat stuff since Twitter won’t keep your tweets after 3,000 tweets. eForm. Basically, you can create forms within FilesAnywhere, using an easy to use visual editor. Then you can publish the form link or embed it in any HTML pages, and record all form submission data in your FilesAnywhere account. Security is a big deal at FilesAnywhere. Apart from usual 128-bit and 256-bit AES encryption for data uploads and all your files on the server, there are other security measures put in place too. Independent Security Evaluation– FilesAnywhere engage independent, third-party security experts to test and ensure that their network and software system are secured. Daily external vulnerability tests are ran, and they have been audited for ISO-27002 compliance. Three-Tiered Testing– In order to eliminate bugs, mistakes and glitches before introducing any new codes or changes to their network and system, updates are tested at a minimum of three levels before releasing for live environment. Off-site, Monitored Data Center– FIlesAnywhere’s data centers are monitored 24/7/365 by trained security team and have strict protocols for physical access into servers. Now you might think that this is all mambo jambo marketing talk, but when Duetsche Bank, BBC, Du Pont, CITI Capital, The University of Chicago and GE are among its corporate customers, it is apparent that FilesAnywhere really take its security very seriously. FilesAnywhere has pretty extensive knowledgebase, and ticket support system for personal users. Although rich in feature, the software and web dashboard are nowhere near complicated to use so not much technical support is actually needed. They also provide VIP support with live telephone and dedicated support for business users as well. We didn’t get a chance to test their VIP support but our search around the web reveals that FilesAnywhere is quite attentive to its customers. It’s knowledgebase is a joy to browse, and email support is responded within about 6 hours. Impressive, actually. Account creation is pretty easy. 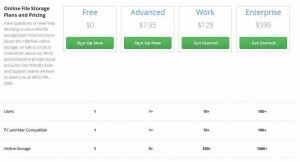 Just click on Sign-up on the website, and you will be led to a page where you have to choose a plan. Here we went with Free Account for testing purposes, and delighted to find that we don’t have to fill in too many form fields. Just username, your name and email address are enough. Password will be mailed to your email. After we registered, we are led to another page with different design, which confused us a bit. It seems like FilesAnywhere redesigned their website and missed out the redirect page after signing up. Regardless of the case, the confusion may be enough for normal end-users to feel like they are in a wrong website. So we checked out the log in page through “Log-in” link from FilesAnywhere.com main site, and it led us to a page with new design. Confusing, we know. So anyway, when we log in, we are welcomed by a welcome screen, and right after that we are put in our web dashboard, in My Files page. So let’s try uploading some files here. You can actually drag and drop your files and folders into this web dashboard, and it will automatically start to upload the files. Or you can just click on “Upload” button at the top right corner. File uploads are actually fast. 1MB image we tested only took about 10 secs. Compare this to Dropbox’s 22 second and SugarSync’s 18 second, it is significantly faster. Note that we are testing on a 6mbps ADSL line. Now let’s explore what’s in Share tab. Apparently in that tab, there are several features that allow you to do file sharing, as well as accept files other people want to share to you. A bit of warning here: it might overwhelm you first but the interface is very simple enough so that you can get a grasp of everything under 30 secs. We will not go into details of each feature here since it’s easy enough for any users to explore. In brief, there is Access & Permission on most of the features on Share tab, where you can set password protection for your share links or Dropbox links, link expiration date, allow either only view files or download, limit how many downloads are allowed, and even track file activity. We haven’t seen such extensive features with file sharing on any other companies, not even on Box.net. Impressive array of features here. 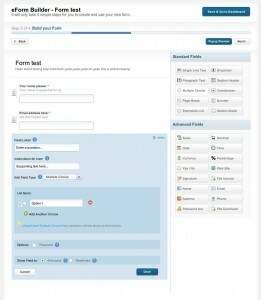 EFORM tab is where you can create your eForms (no pun intended), view previous forms’ submitted data, and manage them. Let’s create a test form here. When you first start, you will be welcomed by Getting Started page, and in next page, you will see an easy to use visual editor where you can choose what form elements you want to include, and configure each of them. After you are satisfied with elements in your form, you can hop along to next page where you can choose desired theme. Not many choices here and changes are only in coloring, mostly. Then next page is where you get the link to share your newly created eForm. You can also get HTML embed code if you want to embed the form in your web pages. In Tools tab, this is where you can convert your docs and images to PDF, look up reports, manage file and folders life cycle, create virtual folders, enable plugins such as Zoho Editor and Aviary Image Editor, and group your files using several taxonomies such as tags, file types, date, and whatnot. This is the page with most features and you should take your time to go through each of them. In History page, you will see file history, logs and whatnot. At the top right corner, you will see your first name and when you click on it, you will be able to go to your Account Settings, and that’s where you can upgrade your storage, add additional users and change other information like passwords and billing information. One thing we don’t like about FilesAnywhere web client is that we can’t find easily where to download desktop client, nor any links to its mobile apps. You have to go to Account Settings and go under Mobile & Sync, or go to main website and look at the footer for download link. Having to dig that much and giving no prompt to download even desktop client is really a bummer. The desktop client is very simple as well, and pretty straightforward. Configuring which folders you want to sync and backup is just drag & drop into the client, or use the built in configuration function. That’s pretty much about it so we leave out our review for the desktop client software. Speed tends to be the same as uploading via a browser. FilesAnywhere is really solid, and offer a wide array of features, but it left a mixed impression for us. Sure, it is definitely feature-rich without overwhelming the user. 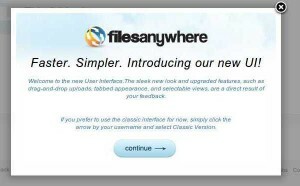 And judging from its features, it is apparent that FilesAnywhere is never intended as an online backup solution provider but rather for online file storage and sharing, maybe targeted more towards business-oriented users. But for users looking for the best bang for the buck option, it’s going to disappoint. At $9.95, you only get 8GB of storage, but at Dropbox you get 100GB for $9.99 a month. SugarSync will give you 32GB for free and at $9.99, you get 60GB additional storage. Heck, even Box.com – a service that FilesAnywhere seem to be competing with – gives you 25GB at $9.99 per month. So the price per GB at FilesAnywhere leave a lot to desire. Perhaps if they bump up their free storage offer, or at least offer 25GB to 50GB at $9.99 a month rate, they will become a serious contender in this space. Otherwise, we don’t see it getting mainstream attention for home users. Maybe this is their intention, since they seem to be doing fine with corporate customers. 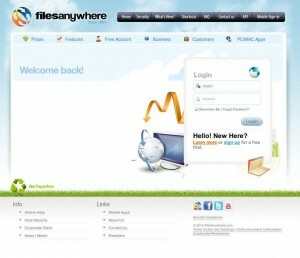 If you are business-oriented user and share files a lot, then definitely look for FilesAnywhere. If not, why don’t you try Dropbox, SugarSync, Wuala or SpiderOak to see if any fits your need? Agree that they offer an expensive service. Interesting that you cannot revert back to the free service. You must close the account. When I download my files it resets all the date/time stamps. Big ouch for me. I cannot recommend this service. There are so many better, cheaper, alternatives like box, dropbox, onedrive, etc. Service is extremely slow compared to others, much more expensive and has horrible billing practices. Just found out about this software. I see that there is a free (https://www.filesanywhere.com/coolbackup/cbindex.aspx#) version of their software but i cannot understand if i can use this free software with other webdav servers. The fact is that i already have a webdav space, and i would like to use it with this software (or any other that performs similarly). Anyone can tell? There are so many features with this service that you could get any type of work done…even personal stuff! It’s weird when I have to ‘fax’ something but this service offers that too. Handy tool to keep around.